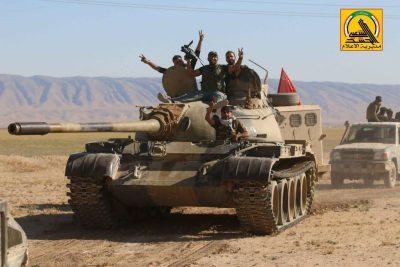 The Iraqi Popular Mobilization Units (PMU) are rapidly advancing against ISIS terrorists in the border area with Syria. Since the start of the Operation of Muhammad the Second Messenger of Allah the PMU has liberated about 3,500 km2 and over 110 villages from ISIS terrorists in western Iraq. Now, the PMU is clearing area southwest of the recently liberated town of al-Baaj. Iraqi security forces have been putting pressure on terrorists in the remaining ISIS-held area of western Mosul. However, ISIS keeps a fierce resistance to the advancing government forces. Eleven Iraqi soldiers were killed in an explosion of a booby-trapped house in al-Zanjili. Meanwhile, the leadership of the autonomous Iraqi Kurdistan Region announced that the region will hold a referendum on independence on September 25th, 2017. Iraqi Kurdistan gained autonomous governance based on the 2005 constitution. It has own armed force called Peshmerga. If the independence referendum takes place, it may lead to further destabilization of Iraq and the whole Middle Eastern region. The US-backed Syrian Democratic Forces (SDF) are storming the ISIS-held city of Raqqah. After the first gains, SDF units faced some resistance from ISIS terrorists and now they are engaged in an intense fight in the eastern and western parts of the city. The Syrian Army and its allies have captured the Zenobia Resort located 4 km east of the Al-Sukkari quarries and the Tal Al-Fari area 30km east of Swanih village near Palmyra. They have also taken control of the strategic Mustadirah mountain chain near the village of Arak. Some pro-government sources argue that this was the first sign of a wider advance in the direction of Deir Ezzor. However, this still has to be confirmed. According to available information, the Syrian military does not have enough manpower in the area to launch the operation right now. Liwa al-Quds fighters actively participate in this campaign.